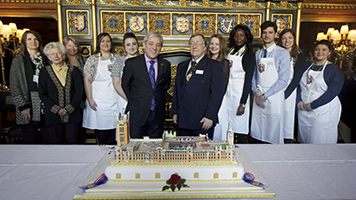 A giant three tier fruit cake in the shape of the Palace of Westminster was presented by the National Bakery School to the House of Commons to commemorate this historical milestone. The giant cake – which was 2 feet wide by 3½ feet long and 1 foot tall – was handcrafted in the shape of iconic Big Ben and the Houses of Parliament. Donated by the Worshipful Company of Bakers, London's second oldest guild, the gift marked the 750th anniversary of Simon de Montfort's parliament (20 January 1265), which is widely recognised as the beginning of the House of Commons. Dr John Marchant, Head of National Bakery School said: "We have worked extremely hard to design and create a cake which really emulates this momentous occasion in a way that was both celebratory and fun. We are honoured to have been given the chance to commemorate such a significant milestone for the nation and hope our cake really encapsulated the importance of this special day." Representatives of the Worshipful Company of Bakers, the City of London and Parliament were at the presentation, along with the students from the National Bakery School and pupils from Sir John Cass primary school in the City.